The INTERNET WORLD EXPO 2019 will take place in halls C5 and C6 at the Munich Exhibition Grounds. 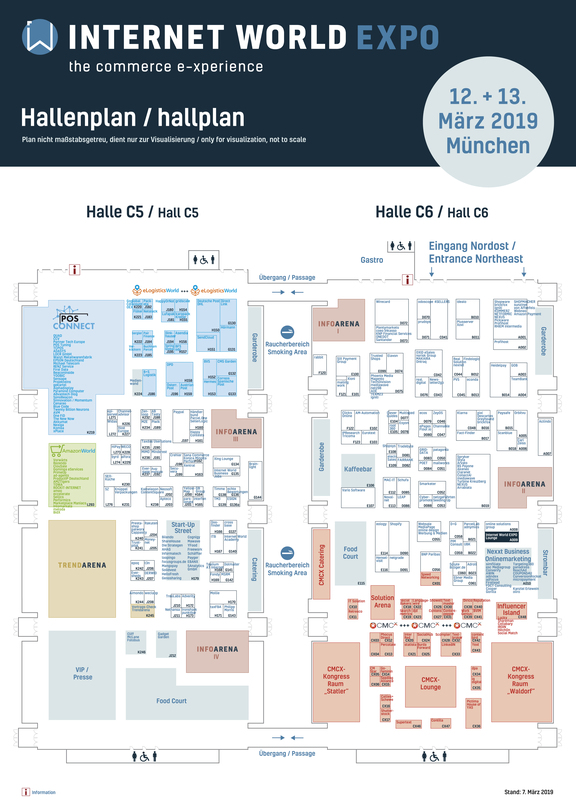 The hall plan with all exhibitors 2019 will be available here by the end of February 2019. In the the TrendArena, the stars of e-commerce will share their experiences, forecasts and expectations. The host at the TrendArena 2019 will be Daniela Zimmer, Head of E-Commerce at Internet World Business trade magazine. At the Info arenas I – IV, INTERNET WORLD EXPO exhibitors will present their products and services in 20-minute talks, giving tips and recommendations. The speakers and the program 2019 are now online. In the Start-Up Street, more than 40 businesses, none older than 4 years, will present their products and services for e-commerce. The offers presented range from latest solutions for product presentation on the Internet to new approaches to eLogistics. At a special exhibit, with 500 square metres, operators of stationary stores can discover which new digital products and services will influence stationary sales of goods and services up to 2025 and the resulting cross-selling opportunities arising for online trade. These include Beacon-applications, RFID, Digital Signage, in-store promotion and VR/AR.